ALAMEDA, Calif. — The running game was full of fits and starts on Sunday and Marshawn Lynch could not get going. No gain. No gain. A loss of a yard. A two-yard pickup. After four carries against the Cleveland Browns, Lynch was getting hit in the backfield and had one yard to his name. So late in the first quarter, Lynch gathered the Oakland Raiders‘ offensive line, purportedly one of the more powerful units in the NFL, and delivered an impassioned speech, the language, no doubt, more colorful than the wool Raiders ski cap adorning his head. “Yeah, I’ll keep that private,” Raiders center Rodney Hudson said with a smile of Lynch’s specific words. With more push from the O-line and, perhaps a better scheme, Lynch ran wild after his sideline pep talk, and looked even angrier in doling out punishing hits after he was ruled down early on a 6-yard pickup down the left sideline. Lynch’s legs were still churning when the whistle blew, otherwise he was gone for a 75-yard touchdown run. No wonder he tried, unsuccessfully, to punt the ball in frustration post-whistle. Instead, he kick-started the Raiders and punished the Browns, finishing with 130 yards on the ground, on 20 carries, his highest rushing game since going for 140 yards for the Seattle Seahawks against the New York Giants on Nov. 9, 2014. 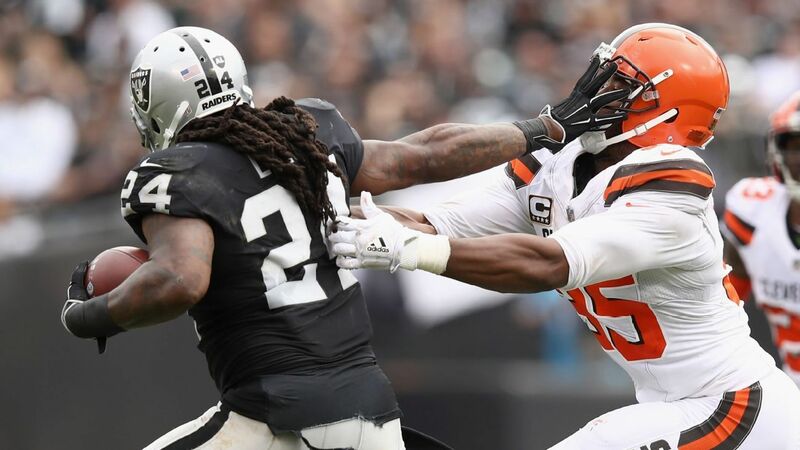 But perhaps more impressive than what Lynch has given the Raiders on the field through the first quarter of the season — his 300 rushing yards lead the AFC and, after forcing 11 missed tackles by the Browns, leads the NFL with 22 missed tackles, per Pro Football Focus, and his 3.74 yards after contact per attempt among running backs with 40 or more touches is third — are the intangibles he provides in the locker room. Yes, Beast Mode, and all that implies, is a team leader. Which might surprise the likes of Raiders coach Jon Gruden. Because remember, Gruden took the job in January having never met the enigmatic Lynch despite being in ESPN’s Monday Night Football booth the previous nine seasons. Oh, sure, Gruden had requested Lynch in assorted production meetings over the past near decade but, no dice. Now, Chucky is getting the full Beast Mode treatment. Then what about those intangibles? Last season, Lynch brought young backs Jalen Richard and DeAndre Washington out with him during pregame introductions, to share the spotlight. “Them my [brothers],” Lynch said after the Week 2 blowout of the New York Jets. Richard said he was nervous when Lynch told him and Washington to join him. But in Week 7, “Beast Mode, and all that implies” reared its ugly head. Lynch ran onto the field to protect his cousin Marcus Peters, then with the Kansas City Chiefs, after a late hit on quarterback Derek Carr. In the ensuing brouhaha, Lynch grabbed an official and was suspended one game. • Can Jaguars’ defense contain Chiefs? In his week away, Lynch practiced with his old Oakland Tech high school team. It made many wonder if Lynch, who was anything but effective at that point, was worth the hassle of being an olive branch, of sorts, to Oakland on the Raiders’ way to Las Vegas. He has yet to say why he sits during the national anthem and, after all, Lynch is nothing if not a brand unto himself, the Raiders selling Beast Mode gear in their team store at camp. And we’re not talking about the countless acts of charity he performs for his community. But when Oakland’s favorite NFL son returned from suspension, Lynch was the Raiders’ most productive offensive player, averaging 4.6 yards per carry while rushing for 625 yards with five touchdowns in eight games. This season, at the age of 32, he is averaging 4.4 yards but has scored three TDs. He even took the unusual step, for him, of speaking with reporters after the Week 3 loss at Miami. Last weekend’s unlikely physical comeback win against the Browns is Exhibit A. But he might have paid a price. Lynch, who rarely misses practice, sat out Wednesday’s non-padded affair because of a shoulder injury. And a unique way of leading and influencing teammates. Last season, the deeply religious Carr, wearing a “Jesus Loves” T-shirt, would nod his head in acceptance as Lynch addressed teammates — with a carpet-bomb of F-bombs, MF-bombs and S-bombs. But that’s what make Lynch who he is. As Lynch took Richard and Washington under his wing in 2017, he did the same with undrafted rookie running back Chris Warren this offseason. “He would go talk to him and teach him something,” Carr recalled. “Whatever they were talking about, running back stuff … he does something that is so special for our team that he goes to a guy that maybe may not even make the team, but he sees value in him and he creates a conversation, creates a moment for him to try to get better.